With an amazing tropical aroma, this luxurious conditioner contains Organic Coconut. Exploding with aromas to enrich your senses and soothe your day. Contains Glycerine and natural Vitamin E.
Wash hair with Faith in Nature Coconut Shampoo. Rinse well and massage gently into wet hair. For best results, leave on for 5 minutes. Rinse well. For frequent use..
Below are reviews of Faith in Nature Coconut Conditioner - 740ml by bodykind customers. If you have tried this product we'd love to hear what you think so please leave a review. Love faith in nature great products. The shampoo and conditioner's are amazing they leave your hair soft and adds volume. 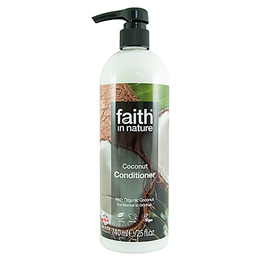 With an amazing tropical aroma, this luxurious conditioner contains Organic Coconut. Exploding with aromas to enrich your senses and soothe your day.